This paper introduces brainstorming games developed for the use of game designers. Three games designed especially for generating new game ideas were developed in the GameSpace project, which studies methods for design and evaluation of casual mobile multiplayer games. GameSpace idea generation games have been developed through an iterative process in collaboration with the end users: game industry professionals. According to our workshop experiences and tentative results from a pilot study, idea generation games can be successful devices for the creative work of game designers. Gamebased idea generation techniques provide an easily facilitated, focused yet playful setting for coming up with new ideas. However, our experiences indicate that idea generation games feature special challenges that must be taken into consideration when designing such games. Kodu  (description from Kodu site) is a visual programming language developed by Microsoft made specifically for creating games. It is designed for children. The programming environment runs on the Xbox, allowing rapid design iteration using only a game controller for input. The Art of Game Design: A Book of Lenses  shows that the same basic principles of psychology that work for board games, card games and athletic games also are the keys to making top-quality videogames. It is designed as a book teaching game design for anyone, no technological expertise necessary. The book gives the reader one hundred sets of insightful questions (lenses) to ask themselves that help make your game better. The lenses are gathered from fields as diverse as psychology, architecture, music, visual design, film, software engineering, theme park design, mathematics, writing, puzzle design, and anthropology. "Anyone who reads this book will be inspired to become a better game designer and will understand how to do it." has very good reviews on Amazon. 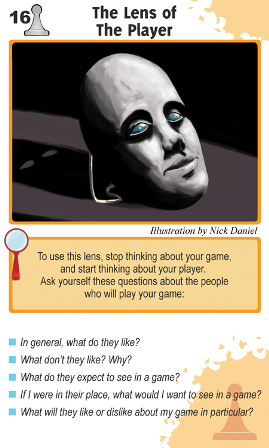 You can also order a set of cards that include the 100 lens questions to use in game design brainstorming or testing. The website includes a list of the 100 lenses  with some sample cards (see images below). Writes for Game's Game and the IGDA (International Games Developers Association) A series of articles, FAQs, answers to reader questions, and tips on producing games from the business perspective. Includes advice on steps needed to start a game company, how to apply for jobs in the industry, recommended reading, how to build a portfolio, design advice, writing for games, freelancing, legal issues, etc,. Very comprehensive and currently active site (although the design looks quite dated). Forum style site for fans and designers of board games. They run contests, list job postings, and host discussion forums about aspects of game design including design theory, mechanics, prototyping, game ideas, play testing, and publication. You need to create a profile and login to participate in the site. 40 essential social mechanics that have ever existed, in order that game designers need never have to reinvent them again. 1: The simplest form of multiplayer is simple advice and assistance. How good are your channels for communication? Helping is the building block of all social gameplay. Parallel symmetric games: darts, golf, snowboarding. You play alongside each other, comparing performance. Meausring progress against someone else is what makes it multiplayer. 2: Quantifying achievement. Putting it into a database. 3. Races. The first user to reach a goal, wins. Curiously absent. Why not have races to a level? You can use this in a network setting. Social games don’t tend to use racing. 4. Leaderboards: everyone competes asynchronously, parallel with historic attempts. We see this in neighbourbars. 5: Tournaments: bracketing users. Social games tend to use bracketing for simple pvp matchmaking: it’s under utilised. 6: Opposition. A rival good is something that can’t be used by someone else at the same time. You have my stuff, I can’t use it. Non-rival is stuff that clones itself: information, etc. 7: Dot-eating. I ate it, you didn’t. Zero sum resource consumption. 8: Tug of War. A winner and a loser. 10: Secrets. Fog of War. Hands of cards. 11: Last man standing. Deathmatch. 12: Bidding. Mediated status. You bid, you take your rival goods (money) and whoever gets the thing, wins. Where are the silent auctions in social games? 13: Lying. Deception and bluffing. Deception only works against other people; not a computer. We depend on quantifying things in our social games; the more we move into psychology the more we can leverage things like bluffing. 14: 3rd party Betting. Betting is driven by the human brain’s bug at calculating odds. We’re lousy at it. This only works on people; you can’t do it vs a cpu. 15: prisoner’s dilemma. Players don’t have all the info, they’re on the same side. If either one caves, they both lose. If they both hang together, they will succeed. You don’t know if the other person will uphold their side. We currently don’t see this in social games. Yet. 16: Kriegspiel. Tabletop military strategy, effectively. Creates the dungeonmaster, the gamemaster. A referee enforces the rules, a gamesmaster directs the action, directs the game. We don’t do much directing in social games right now, but we could. 17: Roles. How many multiplayer games can you think of that don’t have positions on a team. We don’t use team roles or classes in social games. That’s fascinating. This one is guaranteed to increase retention. 18: Ganging up. Being it. Hot potato, Tag. Victim & Hunter. 19: Rituals. Role transitions: weddings, cut a cake, levelling, ding gratz. What is the social game equiv of attending the wedding? Shared rituals bind community like nothing else. The biggest thing that marks rituals is gifts. This one I’m happy to say, we’ve nailed. 21: Reciprocity. Players will send what *they* want, as they know they’ll get it sent back to them. 22: Mentoring / Twinking. When a hilev hands a lowlev a pile of stuff. It’s hugely welcoming. It’s not cheating, it's powerful social glue. 23: Identity. Means of displaying your status inside a social context. 24: Ostracism. Group removal. Denial of resources. 25: Trust. Does your game call on your to trust someone you don’t know? 26: Guilds & tribes. Hugely powerful. Barely present in social games. 27: Exclusivity. Velvet rope. VIP clubs. What could this do for your monetisation? 29: Trade. These large-scale structures become dependent upon each other. They’re less likely to quit. We haven’t focused on them selling things to one another… You are shaping societies. You are building the things people play in, talk about, take part in. Be awake to this. 30: Elections. The largest MMO in the world today is American Idol. Politics. 31: Reputation, influence and Fame. Rolemodels for other players to follow or imitate. You can affect the way players behave by making them famous. Don’t publicis the griefers, publicise the wonderful ones. 32: Public goods. Parks. Air. Is there an infinite common resource in your game? 34: Community. Where we start playing games on you, the player. If you don’t have good facilities for community interaction, you miss out on the people who set the tone and opinion for everyone else. They’re the small squeaky wheel with enormous broadcast reach. 35: Strategy Guide. Players are able to solve insane problems as a group via the scientific method. Every player is a fresh experiemtn trial run, they get better, they figure stuff out. But this only works at large scale with shared info. 36: Teamwork. Groups operating together are more successful than those operating on their own. Dragon Kill Points. 38: Supply chains. Chain value, interdependence. 39: User generated content. Design for this. 40: Griefing. Change the rules out from under the players. Sometimes players are reinventing your game for you. A formal approach to game design and game research based on Mechanics, Design, and Aesthetics. Article written by Robin Hunicke, Marc LeBlanc, and Robert Zubek available here:  MDA was developed and taught as part of the Game Design and Tuning Workshop at the Game Developers Conference, San Jose 2001-2004. The system is a formal approach to understanding games that aims to combine game design, development, criticism and technical research into a constructive iterative process. By moving between MDA's three levels of abstraction (mechanics, design, and aesthetics) the game designer can conceptualize the dynamic behavior of game systems to aid iterative design processes and guide the game design toward desired outcomes. From the designer's perspective, the mechanics give rise to dynamic system behavior, which in turn leads to particular aesthetic experiences so thinking about these interrelated processes can help guide game designers more efficiently tune iterations of the game. Mechanics: describes the particular components of the game, at the level of data representation and algorithms. Can be various actions, behaviors and control mechanisms afforded to the player within a game context. Together with the game's content (levels, assets and so on)the mechanics support overall gameplay dynamics. 1. Formal Parameters: Create a turn-based, two-player game. The game will be complete-able in 15 minutes. The gameplay will occur within an 11" x 17" surface. Turns or moves may be signalled by either a six sided dice (D6) or a coin. 2. Formal Parameters: Create a two-player game. The gameplay will occur on a surface made up of hexagonal tiles with a diameter between one and one-and-a-half inches. Gameplay can proceed as either turn-based or simultaneous movement. Turns of moves may be signalled by either a spinner or cards. An 8.5 x 11 inch hexagonal field is available for download (HexagonalField.pdf 627kb) and at Incompetech.com. 3. Formal Parameters: Create a one-player game with a knowable outcome (i.e. not a toy). You shall use only one of the following sets of materials. 4. Conceptual Constraint: Make a game about Red. 5. Conceptual and Formal Constraint: Make a three-player game that cannot be played as a two-player game. 6. Revise a previous game or revisit a previous week's constraint by constructing a new game. 7. Make a further revision of a previous game, and refine your production values paying particular attention to the material, visual and haptic qualities. It's not advisable to create a highly polished version of a game with unrefined gameplay. 8. Make a game whose rules are expressed in a maximum of three haikus. No verbal prefatory remarks are allowed. 9. Make a game that expresses its ideology (point-of-view, belief system, etc.) through gameplay. This project is a set of alernate rules in book/e-book, iPhone app or printed card form that use the boards and pieces of traditional games like Monopoly, Trivial Pursuit, Scrabble, and Clue to make up new games. While not strictly a design tool it is a good example of how existing popular games can be remixed to create new games. This is a card game where the rules constantly change as the game is played. For ages 8+ and 2 - 6 players this is not a design tool per se, but it is another example of how players can manipulate game play and become authors of the game themselves. University of Pennsylvania offers a complete online course on gamification. It is supposedly 4-8 hours a week for it looks like 5-6 weeks. About halfway into the course the topic is "Gamification Design Framework." Stanford' offers this courseon design for human-computer interaction. Walker is a journalist, and borrows the term (hot)topic from the journalistic discipline to describe games the gaming public are likely to invest in at a given point in history -- some topics are just hotter than others. This is a way of saying that you need to do broader social analysis, not just formal game design analysis, to understand what compels people to play. See also Montfort and Bogost who in Racing the Beam take a similar approach to diagnose the rise of the Atari console and subsequent video game crash of 1983. Specific case-studies of games that sold (or should have sold but did not). Industry professionals are interviewed, asked why they think games sell. "During the real-time strategy craze of the late 90's, publishers could just about guarantee that a solid real-time strategy game would sell 100,000 units. On the other hand, a turn-based strategy game needed to be marketed, promoted, and designed to perfection to crest that magical 100,000 unit mark" (p.2). Aldrich, Clark Book jacket review/blurb: "Designed for learning professionals and drawing on both game creators and instructional designers, Learning by Doing explains how to select, research, build, sell, deploy, and measure the right type of educational simulation for the right situation. It covers simple approaches that use basic or no technology through projects on the scale of computer games and flight simulators." U of A has electronic access! This is a complete book on game design in a readable style, I've paged through it so far and it looks good. I paged through this book by chance and it actually has some thoughtfully worded advice despite the sensational title. It might be worth going back to. Use apps - push their capabilities and try new things - consider what's missing. Learn to watch yourself playing. be selective, keep the constraints of a small viewport in mind. As the tendency when everyone has a little bit of say is a product bloated with features, design committees should try to focus on what to remove. The contents are fairly specific to strategically assessing and exploiting current platforms like facebook or mobile games. Game analysis: Developing a methodological toolkit for the qualitative study of gamesby Mia Consalvo and Nathan Dutton.